Think hot and dry. In fact, think very hot, and extremely, extremely, dry. 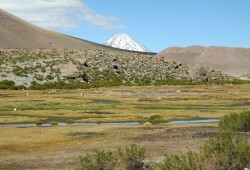 The Atacama is a 1,000km strip of land sandwiched between the Andes and Chile’s Pacific coast. It is the driest hot desert in the world. It is also a breathtaking lunar landscape of salt lakes, sand and lava. Steaming geysers, cylindrical volcanoes, and the shimmering haze rising above the salt make you feel in a different world. At over 2,000 metres above sea level, atmospheric conditions are unique. The combination of clear skies, virtually zero rainfall, and no light pollution means that this is where some of the world’s most advanced astronomical observatories are situated. It also means that there is absolutely fantastic stargazing to be had in plain sight – almost every night. Your gateway is the magical town of San Pedro de Atacama, the archaeological centre of Chile. 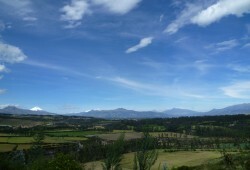 The high peaks and volcanoes of the Andes surround it. This is a good chance to understand the Atacamenian constellations from the point of view of the indigenous peoples, who link them to agriculture and to our place in the Universe. Traditional herbal infusions help you meditate as you contemplate the skies. This is adventure tourism of a deeply spiritual kind. In the far North of Chile sits the most arid desert in the world, Atacama. In the middle of that desert, you’ll find the magical town of San Pedro de Atacama, the archaeological centre of Chile. At an altitude of 2,438 metres above sea level (around 8,000 feet), it is surrounded by the high peaks and volcanoes of the Andes. 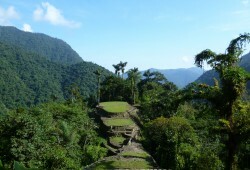 This is where the association of indigenous ecotourism, formed by members of the Lickan Antay ethnic group, was born. They will happily open their homes to you and share with you their beliefs and lifestyle. Here you will shepherd, handcraft, plant, irrigate, participate in caravans and be part of the community. The association is formed by 27 members who came together to strengthen their businesses, generate jobs for local people and preserve and promote the development of their culture, values and nature. They also seek to strengthen community spirit and participation, especially through capacity-building and specialisation. The desert has many secrets for those willing to explore it. Ninety percent of the plants and vegetables are used either for food or for medicine. Enjoy a nice Rica Rica-Sour (a mixture of mint flavoured Rica Rica leaves with the pisco, the traditional Chilean firewater). Or perhaps you might prefer the sweet preparations made of chañar (geoffroea decorticans) seeds like the Arrope (syrup) or ice cream (you can also mix it with Rica Rica ice cream for a very nice combination of flavours). As main dishes, you will enjoy exquisite preparations with quinoa, several types of corn, purple potatoes and loads of fresh vegetables just picked from the orchards! Atacamenians are deeply spiritual people and they have many celebrations throughout the year. One you simply cannot miss is the celebration of the protector of the town: San Pedro, on the 29th of June. Dancers will go all around town accompanying the saint and his guests from other towns. Songs and music will fill your spirit as you go with them to the main square and church for an unforgettable evening. The waters of the Chilean coast are very rich in plankton. 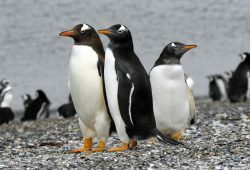 The Humboldt Current, which comes directly from Antarctica fills the sea with these extremely nutritive micro-organisms. This is the best food for whales, and therefore these waters are the best place for them to be. Do not miss the opportunity of sailing next to these huge animals along the desert coast. Their slow but powerful movements will leave you breathless. Read what The Guardian had to say about our road crossing trip in The high road: Argentina to Chile by bus. You can also see the dramatic photo gallery Crossing the Andes by bus: one of the world’s greatest journeys – in pictures of this very special adventure.